This model allows service providers to host all the equipment in their data center with virtual partitioning to support multiple tenants. Typically a router, switch, and phones are the only equipment located with the customer, with all calls traveling over a bundled broadband or WAN connection from the service provider. In this model the Cisco Unified Communications Manager is dedicated to one customer only, while the rest of the call routing infrastructure is still shared with other customers. The service provider can choose to dedicate or share the other unified communications applications as the customers dictate. This model is used mainly for financial institutions or customers who have higher security requirements. This model is for large customer businesses that prefer to own all the equipment in the solution but still wish to rely on their provider to install and manage the architecture. A systems integration team installs the Cisco Hosted Unified Communications Services architecture on site with the customer and provides the same provisioning and operations efficiency as with the other models but within a totally dedicated system. 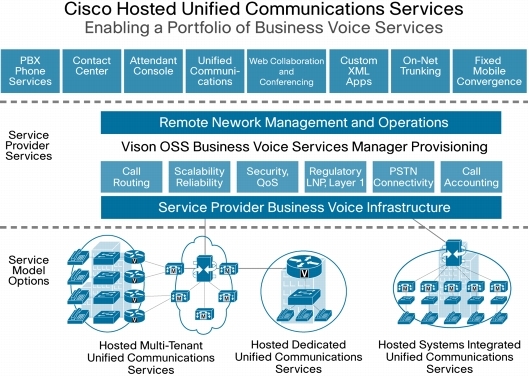 The Cisco Hosted Unified Communications Services architecture addresses complex deployments by providing an end-to-end, robust, and intuitive Web-based provisioning tool. The tool comes loaded with pre-tested Cisco routing templates, dial-plan configurations, and bulk loading interfaces to facilitate faster implementation of Cisco Unified Communications and other Cisco Technology Development Program partner products. Additional value comes from a full suite of network and operations management tools to ensure delivery of the service at peak efficiency, with customer reports guaranteeing service-level agreement (SLA) adherence.